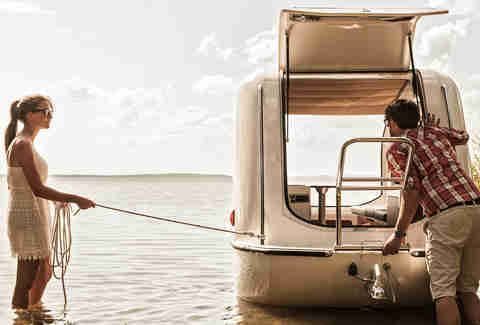 Despite what Matthew McConaughey might have you believe, Airstream trailers are not the only cool campers out there. No, there are others. From trailers that float, to cabins on wheels, to modern-day covered wagons fit for the Oregon Trail/I-80, here are nine of the coolest caravans on the road. 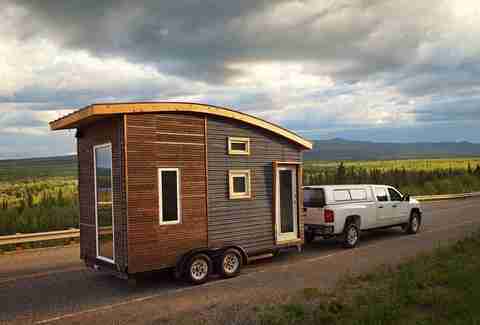 Handmade by a Canadian college professor, each 97sqft Leaf House is built of spruce pine and is tested to withstand even the harshest Yukon winter. It also weighs less than 5,000lbs, thanks to lightweight concrete kitchen counters, bamboo flooring, and birch-plywood ceilings. Designed for a family of four, it includes a sleeping loft, murphy bed, bathroom with shower, and a kitchen complete with a small fridge. 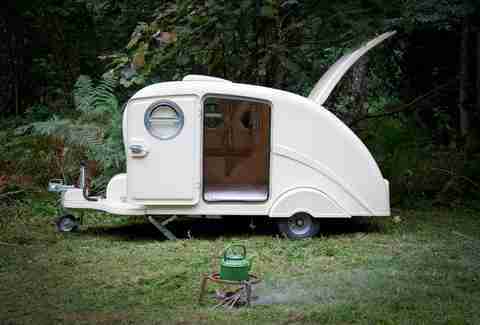 This retro caravan might be small -- it's only 34sqft -- but it won't leave you wanting. The fiberglass and steel trailer features a four-person table that transforms into a double bed, a birch and aluminum interior, and a tiny-but-functional kitchen. And at only 705lbs, it's light enough to be towed by even the smallest car. 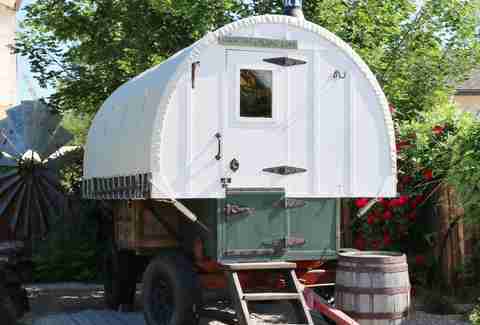 A modern take on the old covered wagon, these custom 2x6ft campers out of Idaho blend antique hardware (lanterns and wood-spoke wheels) with amenities like metal awnings, electric stoves, and even memory foam mattresses. 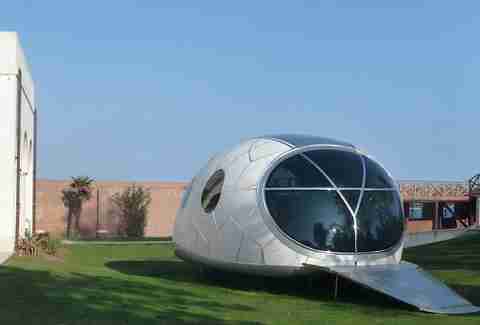 This solar-powered, futuristic pod was designed by Italian firm Architecture and Vision for the Venice Biennale. It’s actually made out of lightweight Carrera Italian marble, of all things, and was conceived as sort of a mobile living room complete with high-tech sound system and state-of-the-art lighting. 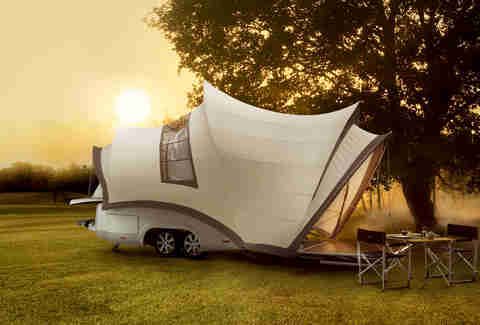 Inspired by (and named after) Sydney’s Opera House, this German/Dutch collab is one of the most luxurious campers on the market and comes loaded with an adjustable electric double bed (that splits into two singles), a ceramic toilet, a wine cabinet, and a kitchen (with espresso bar) that can be moved OUTSIDE. This space-efficient caravan is designed to seamlessly slide onto the back of your Toyota Tacoma and comes with a whopping 13 storage compartments for all your outdoor gear. It weighs 1,100lbs and boasts a queen-size bed, pull-out dining area, and air conditioning, among a slew of other sweet features. This space-age-looking camper out of Austria is designed by something called the Configurator, software that creates personalized vehicles unique to each customer. The minimalist 129sqft body sports light wood custom cabinets, a flatscreen TV, double bed and lofted twin, as well as a kitchen complete with dishwasher, but is unfortunately no longer in production. Designed for rugged off-roading and outdoor adventure, this sturdy Bear Grylls of trailers rocks a reinforced frame and heavy-duty, trailing A-arm coil spring suspension. 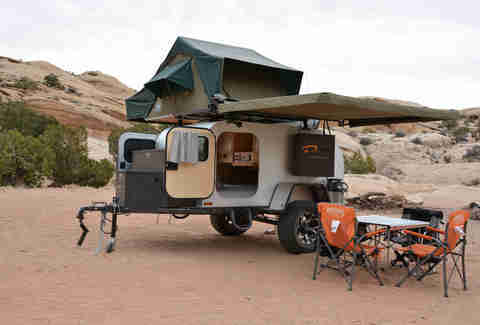 But the Moby 1 isn't all military-style brawn; the interior features built-in speakers, A/C, hardwood cabinetry, fridge/freezer, and a rooftop tent with, no joke, heated beds. Take a closer look, right here. Is this the coolest camper ever? 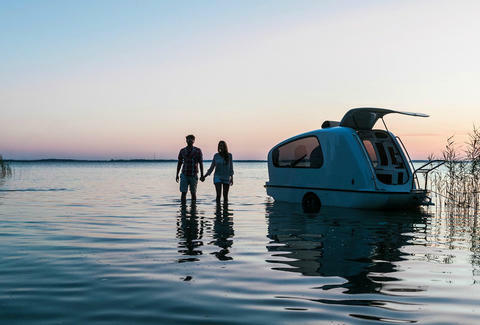 Saving you the trouble of deciding between a boat and a camper, the Sealander's an amphibious vehicle that quickly transforms between the two. 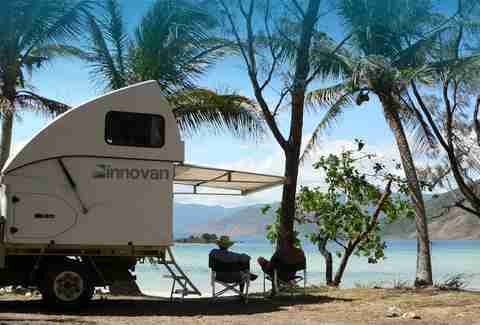 It can be customized to include two stainless steel gas cookers, a sink and water pump, toilet, and sound system, among other perks. And with two huge windows and a roll-up tarpaulin roof, you can stare at the stars whilst falling asleep to the soothing sound of water slapping against the hull.